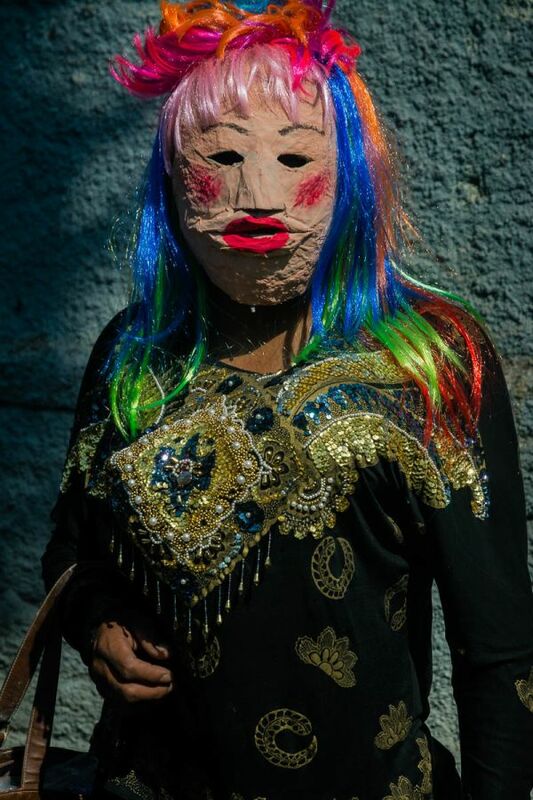 Another year of Carnaval celebrations in Ajijic, Mexico, has come and gone, and the masked zayacas along with it. These guys (mostly young men and boys dressed in drag) appear early each year in Ajijic during the town’s Carnaval celebrations, which stretch over several weeks leading up to the day of Mardi Gras, el Martes de Carnaval – or, Fat Tuesday. The zayacas always add a lot of excitement and a little danger to the Carnaval parades, as they careen through the streets, chasing and tackling kids, and stuffing their faces full of flour and confetti to the delight of the crowds. This year was no exception. I have a photo series about the zayacas you should probably check out, too. During Ajijic’s Carnaval celebrations, José de Jesus Romero Pérez dresses as a zayaco, a traditional character from the town of Ajijic, Mexico. He wears one of the wooden masks that he carved himself. In an age of Hollywood and Halloween masks, José and his brothers help maintain the zayaca tradition of elegant dress and masks made from wood. Abel Romero Pérez dressed as a zayaco during Carnaval in Ajijic, Jalisco, Mexico. He’s wearing a wooden mask that was hand-carved by his brother, José. A boy about five years old dresses up as a zayaca during on of Ajijic’s many Carnaval-season parades. A zayaco with goat mask and jacket. Zayacos take down a man in the Ajijic bull ring, making sure he gets extra-special flour treatment. A zayaca throws confetti during the Carnaval day parade in Ajijic, Mexico. Zayacos tackle a boy in the Ajijic bullring. The parades end up at the bullring and the zayacos chase them in the enclosed circle, while the crowd watches and laughs from the stands. A group of zayacas make sure that their victim gets his pants stuffed with flour during the Carnaval celebrations in Ajijic. A boy yells out, “What was that?” after being attacked with a faceful of flour. A zayaco sits down at a table of diners eating tacos as the procession goes through the streets of Ajijic. A woman covered in flour during the pre-Carnaval celebrations in Ajijic. The crowd covered in flour during the pre-Carnaval fiestas in Ajijic. Kids love being chased and grabbed by the zayacas as they run through the streets to avoid their grasp. A zayaco performs a wrestling move on a boy in the Ajijic bullring. Zayacas dance in the street during a brief interlude of the parade. Taunting and egging each other on is a large part of the excitement of the pre-Lenten fiestas. A boy lays under a pile of zayacas after being tackled on the hard cobblestone street. Sergio Martínez tries to get away from a zayaca while the crowd laughs. A zayaco in traditional elegant dress and a wooden mask. 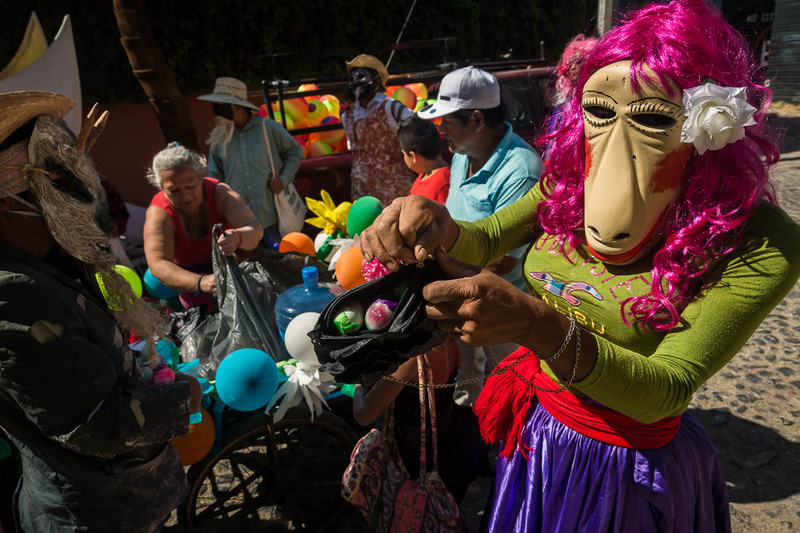 A zayaca zips up some eggs, filled with confetti, into a small handbag before the Carnaval parade. An infant isn’t sure how to react after being doused in flour by one of the zayacas.